For other uses, see Logic (disambiguation). 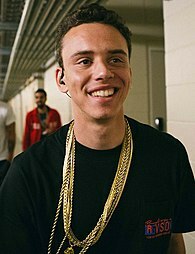 Sir Robert Bryson Hall II[a] (born January 22, 1990), known professionally as Logic, is an American rapper, singer, writer, and record producer. Raised in Gaithersburg, Maryland, Logic developed an interest in music as a teenager, and ventured into a musical career in early 2009, releasing Logic: The Mixtape and a mixtape titled Young, Broke & Infamous in 2010. He then signed with Visionary Music Group, and subsequently released three additional mixtapes over three years. His fourth mixtape, Young Sinatra: Welcome to Forever (2013), was released to critical acclaim and allowed Logic to secure a recording contract with Def Jam Recordings. His debut studio album Under Pressure was released in 2014 and peaked at number four on the U.S. Billboard 200, and was eventually certified gold. Alongside its follow-up The Incredible True Story (2015), both albums also received mostly positive reviews from critics. After releasing his debut commercial mixtape Bobby Tarantino in 2016, he released his third studio album Everybody in 2017. Everybody marked a breakthrough in his career, as it became his first to peak at number one on the Billboard 200, and was his first to become certified platinum. The album also contained the single "1-800-273-8255", which reached number three on the U.S. Billboard Hot 100, and was a top-ten hit internationally. His next two releases— Bobby Tarantino II and his fourth album YSIV— were both released in 2018; each debuted within the top-two on the Billboard 200, and enjoyed generally positive critical reception. Outside of music, Logic has released a novel titled Supermarket (2019), which was accompanied by a soundtrack of the same name. Sir Robert Bryson Hall II was born on January 22, 1990, at Shady Grove Hospital in Rockville, Maryland. He was born to Robert Bryson Hall, an African-American Maryland native and a Caucasian mother. Logic spent much of his youth in the West Deer Park neighborhood in Gaithersburg, Maryland. His father suffered from a cocaine addiction and his mother suffered from alcoholism. Despite his father initially being absent in his childhood, Logic was able to reconnect with Hall due to his burgeoning rap career. 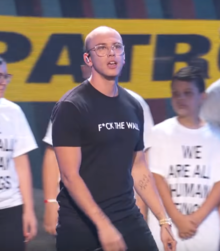 During his early adolescent years, Logic witnessed his brothers produce and distribute crack cocaine to "addicts all over the block", including to his father. Logic maintains that he accurately knows how to manufacture and produce crack cocaine following these experiences. He attended neighboring Gaithersburg High School. However, he did not graduate and was soon expelled after he began skipping classes in the tenth grade. Logic would comment on the expulsion, stating "I started doing badly and failed every class but English, so they kicked me out of school, they gave up on me." At the age of 13, Logic met Solomon Taylor, who would soon become his mentor. Logic became interested in rap and hip hop after watching the movie Kill Bill: Volume 1, directed by Quentin Tarantino. The film's score was produced by RZA, a member of the hip hop group Wu-Tang Clan. Following this, Logic began listening to the group, and soon expressed a deep affection for hip hop. Logic bought The Roots' album Do You Want More?!!!??! later that year, which prompted Taylor to bring Logic a large number of CDs containing instrumental beats, for him to write lyrics over. 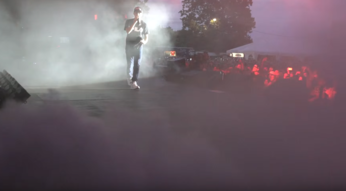 In 2009, Logic performed under the stage name "Psychological" with Logic describing the name as "one name that really stuck [with me]. I just loved this word because it was about the mind and I knew that's what I wanted my music to consist of; something that really challenges the mind". He released an unofficial mixtape titled Psychological – Logic: The Mixtape under his original stage name. The mixtape allowed Logic to serve as the opening act for artists like Pitbull, EPMD, Method Man, Redman, and Ludacris at various shows all over Maryland. Soon after, he shortened the "Psychological" moniker to "Logic". Following these introductory experiences, Logic released his first official mixtape, Young, Broke & Infamous, on December 15, 2010. The mixtape was well received by critics and was the genesis for Logic to establish an early following. Chris Zarou, the president of Visionary Music Group, heard the mixtape and signed Logic to the independent label. Upon signing, Logic stated in an interview, "Visionary Music Group is like Roc-A-Fella. Damon Dash, that's like Chris Zarou of Visionary Music Group, I like to see myself as a Jay. In no way am I arrogant or cocky, I have to see it in order to do it. They did it independent and when they signed with a major, they did it the way that they wanted to do it". The mixtape was confirmed to have been downloaded over 250,000 times on online mixtape sharing platform DatPiff. Logic released his second mixtape, Young Sinatra, in 2011. It serves as the first installment in the Young Sinatra chronology, and the mixtape received critical acclaim from various publications, including XXL. The music video for "All I Do", released on YouTube, gained over a million views in the week following its release. After the success of his previous two projects, Logic released his third mixtape Young Sinatra: Undeniable on April 30, 2012. The mixtape is notable for Logic addressing various personal topics, including his future, his father's drug use, his expulsion from school, and his mother getting stabbed. Speaking about the mixtape, Logic said, "Fans tend to think that if you fall in love with an artist because he makes this kind of sound [but if he gets] bigger and he grows and [his sound changes, people also think he changes]. But with me, I created all types of sounds from the get-go, so you can never say I'm changing." He commented on the musical aspects of the mixtape, stating, "There's stuff on there for the motherf***ers that don't pay attention to lyrics and just want to have fun, but every line is constructed with such depth that the real lyricists and nitpickers have something to listen to." After the release of Young Sinatra: Undeniable, Logic completed his first national headlining tour, the Visionary Music Group Tour. In early 2013, Logic was featured in an edition of XXL, being included as a part of the publication's annual "Top 10 Freshmen List", alongside artists Travis Scott, Trinidad James, Dizzy Wright, Action Bronson, Joey Badass, Angel Haze, Ab-Soul, Chief Keef, Kirko Bangz and Schoolboy Q. Logic completed his first European tour in March 2013, and confirmed his fourth mixtape, Young Sinatra: Welcome to Forever, would be released on May 7. He announced his second headlining national tour, the two-month-long Welcome to Forever Tour, to promote the project. The mixtape was a critical success, with critics praising the project, calling it a "free album", as well as noting the rapper's rapid growth and adaptability. The mixtape received over 700,000 downloads on DatPiff. On April 15, it was announced that Logic had signed with Def Jam Recordings, with Def Jam producer No I.D. serving as the executive producer of his debut album. Logic released a public statement about the signing, stating, "I'm excited to take this next step in my career. It's incredible for Def Jam [Records] and Visionary Music Group to work together, and the opportunity to collaborate [with No I.D.] is priceless. I'm very humbled to be a part of the most iconic hip hop label of all time." Logic toured with Kid Cudi, fellow Def Jam signee Big Sean, and Tyler, the Creator on "The Cud Life Tour 2013", throughout the fall of the year. On November 5, Logic revealed that No I.D., former GOOD Music producer Hit-Boy, RattPack member 6ix, and C-Sick would be providing production on his debut record, with No I.D. and 6ix serving as executive producers for the album. On January 27, 2014, Visionary Music Group released the song "24 Freestyle". The song was released in celebration of Logic's birthday and serves as the first noted collaboration between all VMG artists. On February 11, Logic announced that he would be touring alongside EDM band Krewella on the 2014 Verge Campus Spring Tour. On April 8, Logic released "Now", originally scheduled to be featured on his upcoming free EP titled While You Wait. Logic embarked on the month-long While You Wait Tour alongside fellow Visionary Music Group member QuESt. On April 22, he released "Alright", the third song from the While You Wait project, and features Big Sean. Logic concluded the four-track project, releasing "Finding Forever" on May 7. In summer 2014, Logic announced that no featured artists would appear on his debut album, making it "personal [to Logic] and focused on only me". On August 27, Logic released "Driving Ms. Daisy", featuring Childish Gambino. September brought the announcements of his album title and release date, October 21. The title track, serving as the album's primary single, was released on September 15. On October 14, Logic released the second single titled "Buried Alive", which was the final single to be released as promotion for the album. On October 21, Logic released Under Pressure, selling over 70,000 copies in its first week after debuting at #2 on the Billboard Top Hip-Hop/R&B Chart. On November 12, Logic made his network television debut on The Tonight Show Starring Jimmy Fallon by performing "I'm Gone" alongside The Roots, 6ix, and DJ Rhetorik. On September 8, Logic released the trailer for his upcoming second album, announcing that the album will be released in the fall of 2015 and is considered a "motion picture sci-fi epic". The story, which takes places 100 years into the future, begins with Earth being uninhabitable due to severe human intervention. The primary characters begin traveling to a new planet called Paradise and as they travel, they play The Incredible True Story. It features Logic, Steven Blum (as Thomas), Kevin Randolph (as Kai), and Anna Elyse Palchikoff (as Thalia) as main characters, and the cast took part in a panel discussion to promote and talk about the album at New York Comic Con. Logic, Blum, Randolph, and 6ix returned to New York Comic Con in 2016 to discuss "life after The Incredible True Story. On September 22, 2015, Logic released "Young Jesus", the first single from the album, featuring longtime friend Big Lenbo. "Like Woah" and "Fade Away", the second and third singles from the album, were released on October 14 and November 5, respectively. The Incredible True Story was released on November 13, 2015, surpassing his debut album on the Billboard 200, debuting at #3, with a combined first-week sales of 135,000. The album also topped the Billboard Top Hip-Hop/R&B Chart. It was also the second Logic commercial release to gain widespread critical acclaim. Logic announced The Incredible World Tour, taking place in spring 2016. After the conclusion of The Incredible World Tour, it was revealed that Logic and rapper G-Eazy would be co-headlining The Endless Summer Tour, a nationwide tour, together in summer 2016. Rappers YG and Yo Gotti would be the supporting acts. Two weeks ahead of the start of the tour, Logic released "Flexicution", a song that he teased on social media for months. It features Jessica Andrea on the latter end of the song, where she provides backing vocals. On July 1, 2016, Logic released a mixtape titled Bobby Tarantino. It is Logic's sixth mixtape, and his first since 2013's Young Sinatra: Welcome to Forever and was released unexpectedly via Logic's Twitter account. The mixtape includes singles "Flexicution" (which became his first solo Billboard Hot 100 charting single) and Wrist featuring Pusha T, with the production being handled mainly by Logic and 6ix. On October 3, 2016, Logic revealed the original title of his third studio album to be AfricAryaN, stating that "It's about me being black and white, and seeing life from two sides. [It's about] the cultural evolution and how you can go from the darkest of skin to the lightest of skin […] At the end of the day, we all have so many different ethnicities in our blood, no matter how pure we think we are". On March 29, 2017, Logic revealed the new title of his album called Everybody. The news of his third album was shared and revealed publicly on Logic's Twitter, Instagram, and YouTube account in the form of videos revealing the official album cover designed and painted by Sam Spratt and directed by Andy Hines. The album was released on May 5, 2017. In an interview with Genius, Logic said that his fourth album is likely to be his final one. Everybody debuted at number one on the US Billboard 200 with 247,000 album-equivalent units, of which 196,000 were pure album sales. However, the album also set the record for largest second week drop of all time, as pure sales fell 96% to just 8,000 copies. Its lead single "1-800-273-8255", a song created in association with the National Suicide Prevention Lifeline was certified triple platinum by the RIAA. In August 2017, Logic guest starred in the animated comedy series Rick and Morty, voicing himself as the headliner of a festival. In November 2017, Logic released the song "Broken People" as part of the Bright soundtrack. On February 23, 2018, Logic released a single titled "44 More". It was a sequel to "44 Bars", a song from Logic's 2016 mixtape Bobby Tarantino. The song peaked at number 22 on the US Billboard Hot 100 chart. The following single, "Overnight", was released four days later on February 27. Logic would eventually release another single titled "Everyday", with record producer Marshmello on March 2. Logic would later announced his sixth mixtape titled Bobby Tarantino II, with a promotional video featuring the characters of the Adult Swim series Rick and Morty, on March 7. Bobby Tarantino II was released on March 9, 2018, through Def Jam and Visionary Music Group. The mixtape featured guest appearances from 2 Chainz, Big Sean, and Wiz Khalifa. On March 30, he was featured in the premier episode of Netflix's original documentary series, Rapture. On September 28, 2018, Logic released his fourth studio album titled, YSIV. Before releasing the project, Logic released three singles: "One Day" featuring Ryan Tedder, "The Return" and "Everybody Dies". The album features the song “Wu Tang Forever” which features all the surviving members of the Wu Tang Clan. Logic has also announced an album titled Ultra 85, which currently has no release date. He has also announced that he has written a novel, titled Supermarket. , which he plans to release sometime in 2019. He also has said that he has written and plans to star in his own movie, which he's began to work on. Early in the new year, the rapper dropped two songs unrelated to his new album, "Keanu Reeves" and "Confessions of a Dangerous Mind". Unlike the traditional rap industry, Logic decided to put a twist on his new album Supermarket by expanding his musical abilities, turning this alternative rock album into a new expansion of rap music. He is the first rapper to become a New York Times' number one best-selling author with his novel Supermarket. On April 11, 2019, Logic was cast in an undisclosed role in Naughty Dog's The Last of Us Part II. To properly delve into music as a full-time occupation, Logic terminated a five-year romantic relationship in 2009. He had then stated, "You can put your everything into a relationship, but that doesn't mean you're going to get back what you give. When I created my first mixtape, I realized everything I put in my music — the hours, the lyricism, the time, the grind, pain, sweat, blood, tears — I get it back. I see it." He further commented, saying "The thing is, I feel like so many artists, well, not really artists but so many people think they can rap and they just want a deal and the glitz and the glamour and the women, but they don't understand that all I do and want to do is rhyme... I think I've sacrificed so much from my relationships to my friendships with my family; I've literally sacrificed my entire life, and I'm honest." On October 22, 2015, Logic married Jessica Andrea, a singer and Logic's then-girlfriend of two years. On March 20, 2018, he announced that after two years of marriage, he and Andrea had officially separated. He filed for divorce on April 19, 2018. Nevertheless, they remain friends and did not cite anger as the reason for their split. Logic stated that while growing up, he was a pothead and said, "I don't drink; I don't smoke weed. I used to smoke; I used to be a pretty big pothead when I was younger, but I don't smoke. I might have an occasional glass of champagne." Logic, however, had a serious cigarette addiction, dedicating the song, "Nikki", from Under Pressure to talk about the subject. He talks about smoking since he was 13 and that when giving up marijuana and alcohol, he could not muster the courage to give up cigarettes until about 2014. He, however, pledged not to smoke another cigarette concluding the release of Under Pressure. Logic also has a YouTube channel where he posts videos about his favorite video games. Logic credits Frank Sinatra as his greatest musical influence. Logic cites Frank Sinatra as his main inspiration. Sinatra's influence can be seen in several aspects of Logic's persona, with Logic having the "RattPack" (a play on Sinatra's "Rat Pack" and an acronym for "Real All The Time"). The group of friends consists of Logic's manager Chris, producer 6ix, and friend Big Lenbo. He also describes his female fans as BobbySoxers, as well as referring to himself as "Young Sinatra". As a child, his mother made him watch old black and white movies, which formed his love for the singer. Logic cites Sinatra as instrumental to him being able to carry and articulate himself the way he does, with Logic describing him as an individual who "showcased peace, love, grace, positivity, honor, and valor". Logic has said that various forms of entertainment across many platforms have influenced him, including A Tribe Called Quest, Mos Def, Outkast, Red Hot Chili Peppers, J. Cole, Drake and films by Quentin Tarantino. When talking about music in an interview conducted in late 2013, Logic stated, "I love all subgenres within hip-hop and all genres of music, and I think that's what allows me to make the music that I do, because of my appreciation for the music." ‡ Note: shared with other four nominees. ^ a b "Sir" is part of his name, not an honorific title. ^ "My Father". Retrieved 4 July 2014. my Mother threw a "Sir" in the beginning Official website . ^ Case, Wesley (21 June 2013). "Logic: From Gaithersburg to Def Jam and Hollywood". Baltimore Sun. Retrieved 9 August 2013. ^ "Logic Announces "Elysium" Label". Retrieved 30 June 2017. ^ "Logic - Chart History". Retrieved 17 September 2017. ^ Fleischer, Adam (July – August 2012). "Show & Prove: Logic". XXL Magazine. 16 (5): 38. ^ a b c Nguyen, Michael (17 May 2013). "Logic Details Aligning With No I.D. & Def Jam While Maintaining His Lyrical Approach". HipHop DX. Rappers Talk Hip Hop Beef & Old School Hip Hop. Retrieved 12 August 2013. ^ Calloway, Sway. "Logic Tells His Story, Looking White, Using the N-Word, & 1st Album Being Strictly for Hip-Hop Heads". YouTube. Retrieved 23 May 2014. ^ Smith, Greer (25 May 2012). "Montgomery County rapper rises to fame". The Churchill Observer. ^ B, Hamzah. "Who is Logic?". The Talon. Retrieved 4 April 2019. ^ Victorious, Dro. "Logic Interview". YouTube. Retrieved 11 June 2012. ^ a b c d DelaCuesta, JP (9 February 2012). "Logic: Enter the Mind of the Maryland Spitter". All Hip Hop. ^ "Logic Interview with Gowhere Hip Hop". Youtube. 1 August 2012. ^ a b "RealTalkDMV Presents: Logic – The Genesis". YouTube. Retrieved 11 June 2012. ^ a b Larew, Tim (April 30, 2012). "The Fresh Heir x Decriminals present… An Exclusive Interview with Logic". The Fresh Heir. Archived from the original on December 21, 2014. Retrieved August 31, 2012. ^ a b c d Grube, Dan (1 May 2012). "Logic – Young Sinatra: Undeniable [Exclusive Interview]". Fresh New Tracks. ^ Moore, Marcus J. (15 May 2012). "Download: Logic's Young Sinatra: Undeniable". Washington City Paper. Retrieved 6 September 2012. ^ "XXL Freshman Class 2013 Cover Revealed". XXL. 27 March 2013. ^ "Logic announces title of fourth mixtape". Twitter. Logic. Retrieved 4 March 2013. ^ "Logic announces Welcome To Forever release date". Twitter. Retrieved 4 May 2013. ^ "Logic Announces "Welcome To Forever" Tour Dates". Xxlmag.com. XXL. 16 April 2013. Retrieved 12 August 2013. ^ Guarino, Nick (26 March 2013). "Visionary Music Group Presents: Logic -Welcome to Forever Tour Powered By Thissongissick.com : 32 Date Nationwide Tour [TSIS PREMIERE]". This Song Is Sick. ^ "Logic – Young Sinatra: Welcome To Forever Hosted by Visionary Music Group // Free Mixtape". Datpiff.com. Retrieved 12 August 2013. ^ Paine, Jake (15 April 2013). "Logic Signs To Def Jam Records, No I.D. To Executive Produce Debut Album". Hip Hop DX. ^ "Rapper Logic Signs to Def Jam". Complex. 15 April 2013. Retrieved 12 August 2013. ^ "Kid Cudi Announces 'The Cudy Life Tour' with Big Sean, Tyler, The Creator & Logic (Updated)]". MissInfo.tv. 15 July 2013. Retrieved 12 August 2013. ^ "Logic Grabs Hit-Boy, No I.D. For Debut Album – XXL". xxlmag.com. 8 November 2013. Retrieved 6 December 2015. ^ Llamoca, Janice. "QuESt, Castro, Jon Bellion & Logic "24"". HipHopDX. Retrieved 29 January 2014. ^ Spira, Daniel. "Krewella to Headling Verge Campus College Tour This Spring". YourEDM. Retrieved 9 April 2014. ^ Ortiz, Edwin. "Logic "Now"". Complex. Retrieved 9 April 2014. ^ Guarino, Nick. "[PREMIERE] Logic Releases New Song "While You Wait" + Tour On Sale". This Song is Sick. Retrieved 15 April 2014. ^ Frydenlund, Zach. "Premiere: Logic "Alright" f/ Big Sean". Complex. Retrieved 24 April 2014. ^ Guarino, Nick. "[PREMIERE] Logic – Finding Forever (Prod. By 6ix)". ThisSongIsSick. Retrieved 9 May 2014. ^ Smith, Trevor. "Logic May Scrap "While You Wait" EP, Will Have No Features On Debut Album". HotNewHipHop. Retrieved 26 June 2014. ^ Amaya, David. "Logic to Release "Under Pressure" on October 21, Highly Anticipated Debut Album on Def Jam Recordings/VMG". Def Jam. Def Jam. Archived from the original on September 23, 2015. Retrieved September 15, 2014. ^ Frydenlund, Zack. "Listen to Logic's "Under Pressure"". Complex. Complex. Retrieved 15 September 2014. ^ Jules, Marvin. "Logic "Buried Alive"". XXL. XXL. Retrieved 18 October 2014. ^ Gatti, Walker. "Logic First Week Sales Projections". ^ Gatti, Walker. "Logic – I'm Gone (Live on The Tonight Show Starring Jimmy Fallon)". Free On Smash. Retrieved 13 November 2014. ^ C.M., Emmanuel. "Three Things You Need to Know About Logic's New Album Read More: 3 Things To Know About Logic's New Album". XXL. Retrieved 11 November 2015. ^ "Mind of Logic, Video: The Incredible True Story". Mindoflogic.com. Retrieved 28 December 2015. ^ "Logic and Steve Blum Discuss The Incredible True Story - Where Music and Anime Intersect Part II". New York Comic Con. New York Comic Con. Archived from the original on October 25, 2016. Retrieved October 24, 2016. ^ Frydenlund, Zach. "Listen to Logic's Latest Single "Like Woah"". Complex. Retrieved 11 November 2015. ^ Frydenlund, Zach. "Check Out Logic's New Song, "Fade Away"". Complex. Retrieved 11 November 2015. ^ Mendizabal, Amaya. "Logic's 'Incredible True Story' Crowns Top R&B/Hip-Hop Albums". Billboard. Retrieved 1 December 2015. ^ Lilah, Rose. "Logic Announces "The Incredible True Story" World Tour". Hot New Hip Hop. Retrieved 1 December 2015. ^ Schwartz, Danny. "G-Eazy, Logic, YG, & Yo Gotti Announce "Endless Summer" Tour". Hot New Hip Hop. Retrieved 13 April 2016. ^ Goddard, Kevin. "Logic - Flexicution [New Song]". Hot New Hip Hop. Retrieved 14 June 2016. ^ "ℒσgic♫ アキラ on Twitter". Twitter. 1 July 2016. Retrieved 1 July 2016. This mixtape is for my fans. I wanted to give u something for the Summer. Thank you for always supporting me. Enjoy. ^ "Logic Explains "AfricAryaN" Album Title". ^ "Logic Announces New Album Everybody, No Longer Titled Africaryan". Pitchfork. Retrieved 29 March 2017. ^ "Rap Larry David on Twitter". Twitter. Retrieved 30 March 2017. ^ "Instagram post by @logic301 • Mar 29, 2017 at 7:21pm UTC". Instagram. Retrieved 30 March 2017. ^ Genius (5 May 2017). "Is Logic's Next Album His Last?". Retrieved 28 August 2017 – via YouTube. ^ Caulfield, Keith (15 May 2017). "Logic Scores His First No. 1 Album on Billboard 200 Chart With 'Everybody'". Billboard. ^ Matt, Fish (21 May 2017). "Logic's "Everybody" Sets Record For Biggest Sales Drop For A No. 1 Album Debut". HotNewHipHop. Retrieved 22 May 2017. ^ "Certifications". Retrieved 17 September 2017. ^ Yoo, Noah (14 August 2017). "Logic Raps on "Rick and Morty": Watch". Pitchfork Media. Retrieved 22 September 2017. ^ Armstrong, Megan. "Logic & Rag'n'Bone Man Drop 'Broken People' from Soundtrack to Netflix 'Bright' Film". ^ Thiessen, Brock (22 February 2018). "Logic "44 More"". Exclaim!. Retrieved 9 March 2018. ^ Brandle, Lars (23 February 2018). "Logic Shares New Track '44 More': Listen". Billboard. Retrieved 9 March 2018. ^ "Logic – Chart History: Billboard Hot 100". Billboard. Retrieved 9 March 2018. ^ A., Aron (27 February 2018). "Logic Drops Off His New Single "Overnight"". HotNewHipHop. Retrieved 9 March 2018. ^ Yoo, Noah (2 March 2018). "Listen to Logic and Marshmello's New Song "Everyday"". Pitchfork. Retrieved 9 March 2018. ^ Renshaw, David (8 March 2018). "Logic recruited Rick & Morty to announce his new mixtape". The Fader. Retrieved 9 March 2018. ^ Coleman II, C. Vernon (9 March 2018). "Logic Delivers 'Bobby Tarantino II' Mixtape". XXL. Retrieved 9 March 2018. ^ Reeves, Most. "'Rapture': Inside Netflix's Logic-to-Nas Hip-Hop Doc Series". Rolling Stone. Retrieved 7 April 2018. ^ Holmes, Charles (28 September 2018). "How Logic Reunited Wu-Tang Clan on His New Album". Rolling Stone. Retrieved 4 October 2018. ^ "Logic Announces 'Young Sinatra IV' Album With New "YSIV Freestyle"". Complex. Retrieved 25 September 2018. ^ Billboard, Bobby (8 January 2019). "The Pre Order for Supermarket my debut Novel will be going live Thursday! #SuperMarketpic.twitter.com/vAYW2U2CzH". @Logic301. Retrieved 26 February 2019. ^ Schwartz, Danny; Schwartz, Danny (28 March 2019). "Review: Logic's Uniquely Misguided Literary Rock Experiment 'Supermarket'". Rolling Stone. Retrieved 6 April 2019. ^ Fleischer, Adam (July – August 2012). "Logic". XXL Magazine. ^ "Logic: 'Do Something For Yourself'". NPR. Retrieved 12 November 2015. ^ "Logic Files for Divorce from Wife Jessica". tmz.com. Retrieved 20 April 2018. ^ "Logic Confirms Split From Wife Jessica Andrea: 'It's Very Simple: It Just Didn't Work Out'". Billboard. Retrieved 20 March 2018. ^ Yoh. "Logic Just Launched a Gaming Channel, This Is Why It's A Big Deal". djbooth.net. Retrieved 17 March 2017. ^ "HandsDownMusic Exclusive: Interview with Logic". Hands Down Music. Archived from the original on July 20, 2012. Retrieved June 11, 2012. ^ "The Break Presents: Logic". XXL Mag. Retrieved 11 June 2012. ^ "Logic (Rapper) – XXL Freshman 2013". Xxlmag.com. 30 September 2012. Retrieved 12 August 2013. ^ "Logic Announces 'Confessions of a Dangerous Mind' LP With New Song". rollingstone.com. ^ "Logic Releases New Project to Accompany the Drop of His Debut Novel 'Supermarket'". complex.com. ^ "VMAs 2017: The Complete Winners List". Rolling Stone. ^ "Patti LaBelle Named BMI Icon at the 2017 BMI R&B/Hip-Hop Awards". BMI. 1 September 2017. ^ "See The Full List Of 60th GRAMMY Nominees". 27 November 2017. ^ "2018 iHeartRadio Music Awards: See The Full List of Nominee". iHeartRadio. 10 January 2018. Retrieved 10 January 2018. ^ "Mark Ronson Receives the BMI Champion Award at the 66th BMI Pop Awards". BMI. 8 May 2018. Retrieved 9 May 2018. This page was last edited on 13 April 2019, at 19:58 (UTC).